I got this orchid at a flower market in Taiwan. It has purple flowers that so far haven't opened very wide. There are no leaves while it is blooming. The stems are thick, grey, top-heavy, and limp. The substrate appears to be normal soil. The petals are pointed and separate. The tube is soft, almost as if it is covered in fur. There is no yellow pollen (so far); the entire flower is purple. The flowers are fragrant. The smell is sweet and smells something like grape candy. Comments for Purple terrestrial orchid. 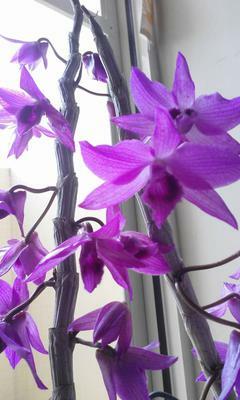 This is a Dendrobium hybrid. They aren't usually grown in soil, so I don't know why that would be. After flowering, you'll want to keep this plant somewhat dry until you see new growth, then start watering heavily. It will like bright indirect light.